A cot bed is a great option over a standard cot as it will last you longer through early childhood and can also make the transition for your little one - from cot to bed - less daunting. That's because cot beds feature a removable side that can be taken off as your child gets older, converting it into a toddler bed with minimum fuss. You’ll find a good range of stylish, safe and ergonomic designs online that cater for a mix of nursery styles and budgets. The best designs have been created with comfort in mind – not only for your child, but for you too. Adjustable mattress heights for example, have been designed with backs and pregnancy bumps in mind, making it easier on your body when you lean over to attend to your child. You can also choose from a range of sophisticated, solid-wood finishes with extras such as storage drawers and canopies, plus matching nursery furniture. Here we’ve rounded up our favourite cot bed designs, chosen for their stand-out features. . .
Made from pure birch wood, this stunning design comes with a simple and stylish harlequin pattern along the side. Finished in a sophisticated grey colourway (shown), it also comes in a crisp, white. There’s a matching changing table in the range too, which will cost you £599. Although it has a fixed side, it does let you switch between three mattress heights, which you can adjust as your baby grows. 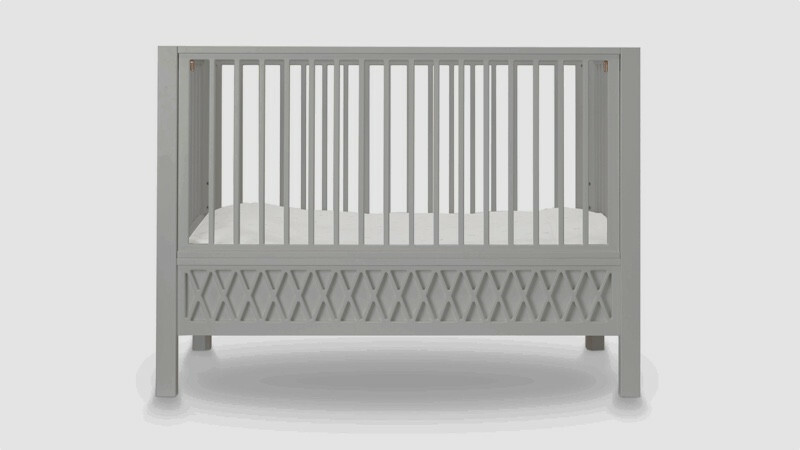 The cot has removable side panels so you can transform the crib into a toddler’s bed when the time comes, and at H72 x L132cm there’s ample room for them to fill. You will need to add a mattress separately - Nubie sells a Little Green Sheep Natural Wool, or Natural Twist mattress, which is a mix of wool and cotton, for an extra £149. It's not cheap, but isn't it gorgeous? If budget and space allow, you can’t go wrong with a timeless piece such as the Sleigh Royale by Boori. It feels satisfyingly sturdy and smooth and comes in sleek white (shown) and English oak finishes. You’ll need to add a mattress and Boori sells a range of breathable natural pocket sprung or soft cotton hypoallergenic versions from £99. There’s also a matching wardrobe, changing table, dresser and chest in the range and once your child outgrows it as a bed, it can be used as a mini sofa. At 107cm high and 157cm long, its one of the larger cots in our round up, so it may feel a little on the roomy side in the early days. But once your child hits the toddler years, the bed provides ample sleep space as well as somewhere for mum or dad to perch at story time. Added extras include a toddler guard panel to prevent your child falling out of bed and a storage drawer below, which is ideal for housing both bed linen and any random toy your child decides to hide there too. 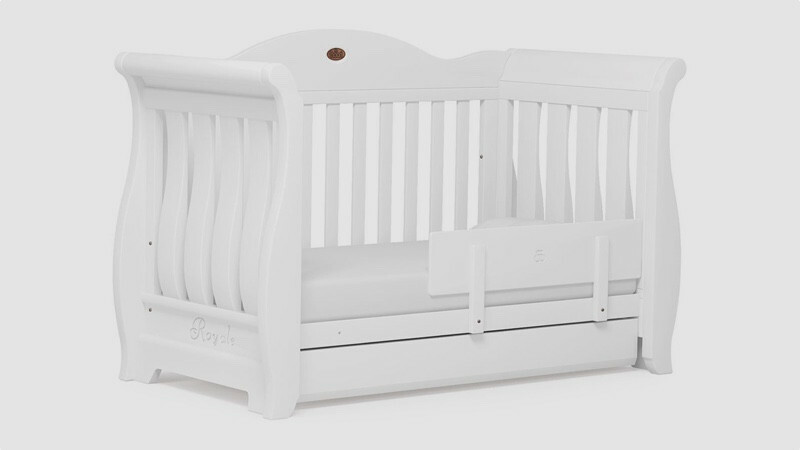 The reasonably priced Gonatt cot bed in white will suit both contemporary and traditional nursery schemes. The base can be adjusted to two different heights and the bed has one side that can be moved when you’re ready to convert it into a toddler bed. 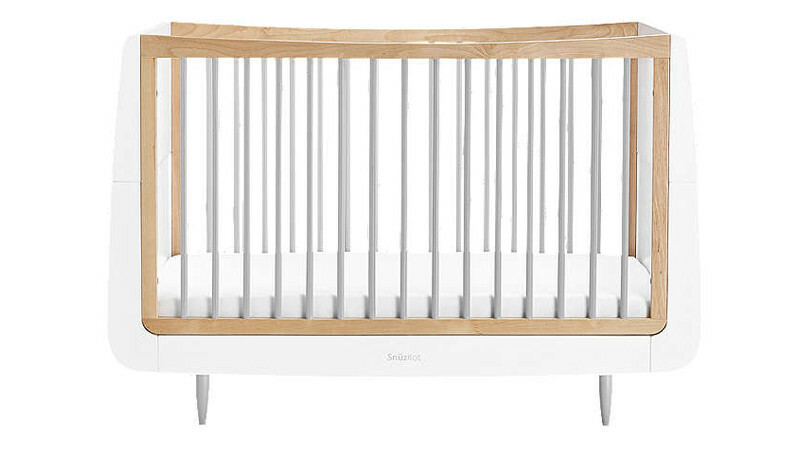 At 75cm high and 143cm long, it’s one of the more compact cot beds in our round up. Although basic in finish and design with fixed sides, it does have the benefit of three handy storage drawers in its base, which are neatly punctuated with three pop-colour drawer handles. There's also a grey version of this design, should you prefer. You’ll need a separate mattress with this cot bed, but you’ll be able to pick one up for under £50, such as the Krummelur at £45. The great thing about the Sleepi set up is that it will see your child through from birth all the way up until around 10 years old. The cot is quite an investment as you’ll have to keep adding to it as your child grows, but you can create four arrangements with its solid beech wood design. A large sleep area can be daunting for a little one, which is why Stokke has started with a cosy 80cm nest-style Mini Cot. You can then expand it with a conversion kit to turn it into a standard-sized cot of up to 125cm. Then, if you take away one of the removable side panels, it becomes a toddler’s bed with easy access for kids. Finally, using the Junior Extension Kit it can be transformed into a 170cm child’s bed. 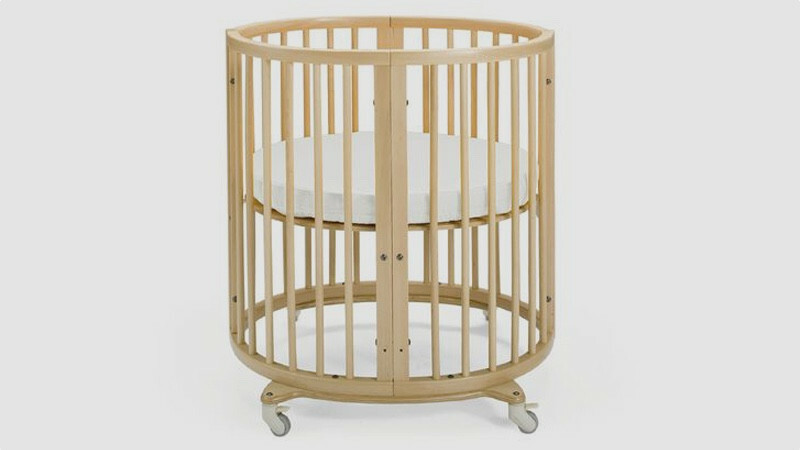 The cot has lockable swivel wheels, which means it can be moved from room to room, and it comes with a height adjustable mattress base too. You need to pay extra for the mattress and custom-made accessories such as a fabric canopy, fitted sheets and Stokke-branded cot bumpers, but with four attractive finishes to choose from - White, Natural, Hazy Grey and Mint – what’s not to love? With a clean and contemporary Scandi design and Haze Grey and natural finish, the Snüzkot Skandi can be used from birth up until four years old. It has a solid beech frame with stainless-steel fittings and there’s also a range of matching furniture including a changing unit and dresser. To make it easy for you to lift baby in and out of the cot there are three adjustable mattress heights. You’ll need to add a mattress, and Snuzkot does a rather comfy pocket sprung model for a reasonable £129.99. Like the Stokke, this design can be converted up to four times. 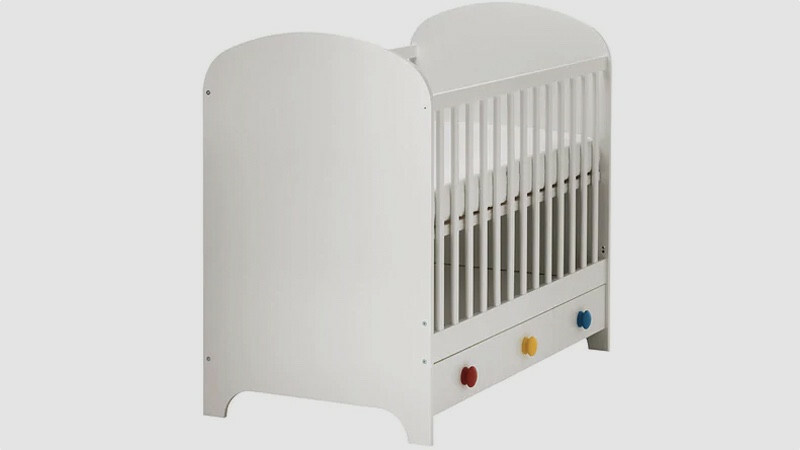 Initially it can be used as a cot for use between 0-18 months. Then with one of the side panels removed, it turns into a toddler bed. You can then take off both sides to create a mini child’s bed and finally add a Junior Bed extension kit to create a longer bed that’s suitable for 4 to 10 year olds.